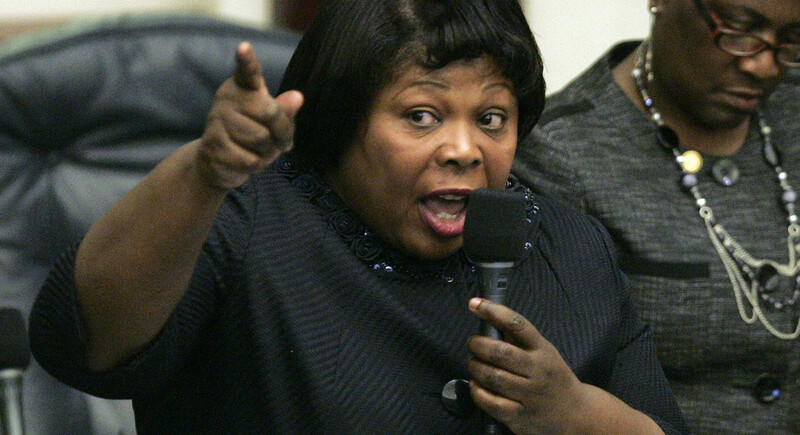 Sen. Daphne Campbell is a synecdoche for epic corruption in Florida. Reminds me of what JFK once said, comparing politicians in different states. As Jimmy Carter said, "I see no reason why big shot crooks should go free and the poor ones go to jail." Good investigative reporting by Matt Dixon for POLITICO -- will the FBI investigate? Will there be a federal grand jury and federal indictments? Watch this Senator. TALLAHASSEE — Scandal-plagued state Sen. Daphne Campbell worked for years to push legislation sought by an organization whose president handed her a purse stuffed with cash during a 2017 birthday party that doubled as a political fundraiser, according to public records and interviews with those familiar with the bill. The Miami Democrat had been lobbying for years to pass the bill to make it easier for foreign doctors to get licensed in the United States. But she never told legislative colleagues what organizations were behind the effort. Lawmakers contacted by POLITICO were “shocked” when they discovered the bill was for a man seen in a 2017 video handing Campbell a purse stuffed with cash. The video, which was taken at a birthday held for Campbell, was first reported last month by the Miami Herald. “She has been pushing that bill for years but members had no idea it was for the cash purse guy,” said one Republican consultant familiar with the bill, which never got to the floor of either chamber for a vote. The bill is the brainchild of Solidaridad Sin Fronteras, a Hialeah-based group that helps health care professionals trained in other countries get licensed to work in the U.S. health care system. During the May 24 party celebrating Campbell’s birthday, which was held at the Miami Shores Country Club, group president Julio Alfonso gave Campbell a Kate Spade purse, shoving a visible wad of cash in it after she opened it, according to the video. Campbell told POLITICO on Friday that the whole episode was a joke, and that the video was the product of those who simply don’t like the fact that she is a Haitian-American. She said she kept none of the money stuffed in the purse. She said the “struggles of foreign trained physicians are real,” and that she is happy to continue supporting the bill. Campbell has been the most frequent recipient of campaign contributions from Alfonso, taking in $3,100 of the roughly $5,500 he has given to state politicians, according to campaign finance records. In an interview with the Miami Herald, Alfonso, like Campbell, characterized the incident as a “joke.” He could not be reached for comment for this story. Along with being registered to lobby on the bill, one of the group’s registered lobbyists, Eli Nortelus, was on emails with Campbell and staff members as the bill was being developed. The appearance of an organization handing a pricey purse full of cash to a state senator who has long advocated for their issue, though, was not viewed as a joking matter among some of Campbell’s Senate colleagues. Hutson said Campbell approached him the year he sponsored it. But he said he had no idea of specific organizations or motivations behind the proposal and that he did not meet with any groups in connection with the issue. Other organizations involved in the medical industry say the issue has long been a priority for Campbell, who served in the House from 2010 to 2016 before being elected to the Senate. “It’s not new [for Campbell] ,” said an industry official directly lobbied by Campbell on the bill. Her office was busy working on this year’s version of the bill, beginning last November, six months after the event showing her receiving the purse full of cash, according to emails and other state records reviewed by POLITICO. “Per your request, here was the suggestions that were provided by the Department of Health,” read a Nov. 10, 2017, email from LaToya Sheals, Campbell’s legislative aide, to Campbell and Nortelus, the Solidaridad Sin Fronteras lobbyist. It contained an attachment from the Florida Department of Health that made drafting suggestions, including using “language from 2017,” a reference to the previous year’s bill, which DOH officials said would make some portions of the 2018 version filed by Campbell unneeded. The Senate’s bill drafting office, which polishes up legislative language before it is formally filed, also hinted that the 2017 language might be best. That email was forwarded by Sheals to Campbell, but there were no follow-up emails provided as part of a public records request. The legislation, FL SB636 (18R), was assigned to Senate committees, but never got a hearing. The House version got one House hearing, but it also failed to pick up steam. The House sponsor, Republican Manny Diaz, said he “has no words” for the video of Campbell getting a purse stuffed with cash, but says he decided to get involved after the local groups reached out to him. He represents Hialeah, where Solidaridad Sin Fronteras is based. Campbell’s latest controversy has not hurt her politically. Incoming Senate Democratic leader Audrey Gibson has already given her a vocal endorsement in her Democratic primary race against former assistant state attorney Jason Pizzo. In 2016, Pizzo lost his race against Campbell despite using more than $700,000 in personal loans. This year, Pizzo has already put $75,000 into his Senate bid. Gibson’s endorsement was made following the Herald's story about the purse and cash, and the accompanying video. Even before this latest incident, Campbell had spent much of her lengthy career in the public spotlight mired in controversies. At one point, Democratic leaders saidshe should “consider stepping down,” but the scandal has not slowed her political ascent. Now, as a member of the state Senate, Campbell is in a contested Democratic primary. — A company owned by Campbell and her husband, Hubert, had been the subject of an investigation by Attorney General Pam Bondi’s Medicaid Fraud Control Unit. — Her son, Gregory, was convicted in 2013 on charges tied to a $300,000 Medicare-fraud scheme. When he was given a new trial in 2017, Campbell got the news on the House floor during a marathon session. She originally thought her son had been exonerated, and the resulting outburst was so loud that other members thought she was having a medical emergency. — Campbell and her husband were hit with $145,000 in liens by federal agents in 2012. The IRS was looking at their financial dealings after former business associates told the Miami Herald and IRS that the couple scammed them. — In 2006, two developmentally disabled residents died in a group home her and her son ran in Miami-Dade County. One had been raped by a resident who Campbell had promised a judge would be monitored, but was not. — She sponsored legislation to ban red-light cameras after her family minivan had been nailed with five tickets.